Media articles that I’ve written. We were recently invited to write about our work on active micromachines. The article can be read for free on the Convesation website. Though the event was limited to only 100 people, ticket-hopefuls waited at the door nearly an hour before the start time of 10 a.m. to claim any available seats. With over 3,000 community events organized worldwide and over half a billion views of TEDTalks available free online, it’s not difficult to see why the U of O community was excited to enjoy a local TED experience. 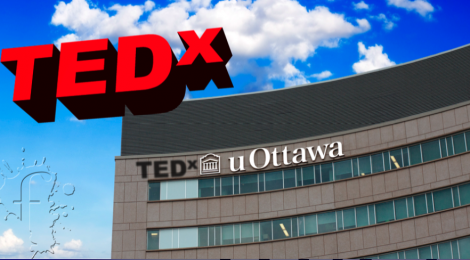 TEDxUOttawa featured presentations by professors, students and recent alumni of the U of O on the theme of “Innovation & Creativity.” Without exception, the speakers rose to the occasion and despite the broad theme, the talks fit well together. The event was live-streamed by Zoom Productions, the SFUO’s video production company. Through the TEDx license, any of the TEDxTalks could be chosen by the central TED organization to be posted at TED.com. The TEDx license is an independently organized TED event. As Matthew Staroste, TEDxUOttawa’s live blogger, explained, the videos will be available to everyone. “It’s about promoting greater ideas in general, so the SFUO will be posting the rest of these videos on the TEDxUOttawa.ca website so that folks who either couldn’t tune in to the live-stream today or couldn’t be here in person can still be part of a TEDx experience,” said Staroste. It was universally acknowledged that the U of O’s first TEDx experience came about largely thanks to one person. “This is Jozef Spiteri’s brain-child,” chuckled Staroste. Spiteri is the vp social of the SFUO and has harboured a dream of hosting a TEDx conference at the university for nearly as long as he’s been a student here. Spiteri even held the license for TEDxUOttawa for two years prior to becoming an executive member of the SFUO. He said he didn’t have to convince the rest of the SFUO executives that hosting a TEDx event was worth the time and effort. “Everyone seemed interested,” said Spiteri. “Everyone was motivated. So when I got elected, I kept working on it and kept in contact with the people at TED. TED conferences are part of an international set of conferences founded in 1984 by the private non-profit Sapling Foundation. The talks were originally planned as a one-off, but they expanded as their popularity grew. THE TEDxTALK AT the U of O was a big success and showcased the best and brightest our university has to offer. Here are some of our favourite speakers of the day. While teaching one day, Salter realized that lecturing was an outdated method of education. No longer seeing himself as a “gatekeeper” to knowledge, he now crowd-sources his syllabuses, giving students the power to decide what they study. Pelling wowed the crowd with his laboratory’s ability to hack biological systems the old-fashioned way—rather than altering cells’ genetic codes, Pelling can create surprising biological systems by altering their surroundings. Growing mice cells in the cellular scaffolding of an apple core was a clear crowd favourite. McLeman warned that the coming climate change will have a major impact on human migration patterns but also advised against being afraid of waves of environmental refugees, reminding the audience that Canada is a country of immigrants that could benefit from those seeking a fresh start. Jones is a U of O student but also the founder and editor of the Art & Science Journal. Through her journal, Jones uses the collision of art and science to foster a sense of wonder. Schacter, a 21-year-old advocate for the de-stigmatization of mental illness, spoke candidly about her experiences with severe treatment-resistant obsessive-compulsive disorder and advocated that openness can reduce suffering. Science and art are sometimes seen as the incompatible arch-enemies of human endeavours. But art can inspire science, and science can animate art. Christopher Smeenk, PhD candidate at the University of Ottawa, researches ultra-fast laser pulses at the NRC-uOttawa Joint Attosecond Science Laboratory. He is also a musician who plays guitar and French horn. For Smeenk, there is no sharp separation between science and art, and no reason why they can’t be blended. Smeenk is fascinated with the idea of creating performances that can be appreciated by more than one sense. In his eyes, visualizations during musical acts are separate performances, layered over the music—the instrument that produces the sound is distinct from the system that creates the visualization. His ideal is an experience that merges sensations, so Smeenk invented an instrument that creates both sound and light simultaneously. Smeenk calls his instrument the Laser Musicbox. Extremely short infrared laser pulses blast through the air, tearing electrons off their atoms and creating plasma. This short-lived plasma is the cause of both the sound and the colour. The hot plasma rapidly expands into the cool air around it, generating a shock wave (this is actually how lightning makes thunder). Smeenk fires laser pulses in quick succession, creating a train of shock waves. The space between the waves sets the notes we hear. But the plasma does a second thing: light can travel faster through the plasma than through the air. This shifts the visible light from infrared to a beautiful oily continuum of colours. The shorter the laser pulse, the more colours are produced. The laser that the Laser Musicbox needs to function is permanently housed in a National Research Council (NRC) laboratory, but Smeenk points out that the first laser was the size of an entire room. He expects that as technology moves forward, the Laser Musicbox could become a mobile instrument, and looks forward to working with musicians and composers. Rock on, lasers, rock on. On Sept. 26, the University of Ottawa broke ground on a five-storey building that will house the new laboratories of three of its most prominent researchers. 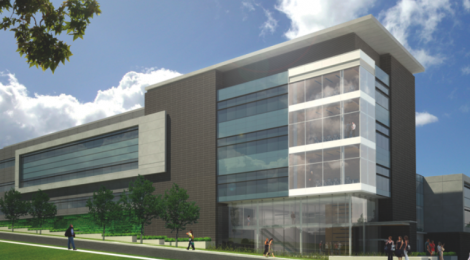 Called the Advanced Research Complex (ARC), the building will be located on the east side of King Edward Avenue, across from the Minto Sports Complex. The ARC, scheduled to be completed in the summer of 2014 at the earliest, will provide multi-million-dollar laboratory space to the university’s vibrant photonics community. According to Mona Nemer, vice-president of research at the U of O, the new building will make the university a leader in the field of photonics. “ARC says something about where the university currently is and where it is going,” said Nemer. The philosophy behind ARC is to bring researchers working in the fields of photonics and geosciences together into one space, regardless of their department or faculty. According to Thomas Brabec, chair of the department of physics, the complex will bring several faculties together. Paul Corkum, one of the three lead scientists responsible for ARC, agrees that organizing scientists by research interest rather than the traditional department won’t be an obstacle. Corkum, who currently studies ultra-fast laser pulses in his laboratory at the Steacie Institute for Molecular Sciences at the National Research Council of Canada on Sussex Drive, will move to the ground floor of ARC in order to join fellow physicist Robert Boyd and geologist Ian Clark in the state-of-the-art facilities on campus. Boyd, a world-renowned physicist who studies quantum nonlinear optics, joined the department of physics as the Canadian Excellence Research Chair (CERC) in 2010. The CERC position comes with $10 million in research funds, which Boyd will use to study how the velocity of light pulses travelling through material systems can be modified and controlled. While Boyd recently moved to the U of O, Clark has been in the department of earth sciences for 30 years. His new laboratory in ARC will house a novel accelerator mass spectrometer that will rocket ions to nearly 10 per cent of the speed of light with very little sample contamination. This will allow Clark to detect the presence of trace radioisotopes at much lower concentrations than traditional mass spectrometers do. Although the ARC building won’t be completed until 2014, Clark’s mass spectrometer will be installed early, in the fall of 2013. In many ways, Boyd, Clark, and Corkum will form the core of the research endeavors at ARC and are responsible for its creation. In 2009, Corkum and Clark independently applied for large research grants, and the university submitted both applications to the Canadian Foundation for Innovation (CFI). Both applications were successful; CFI’s public records report infrastructure contributions of $4.7 million to Corkum’s project and $8.4 million to Clark’s. “It wasn’t a joint project; there were independent applications,” explained Clark. “The two of them together were sufficient research mass to justify a new research building and that’s what [the university administration] was looking for.” The university pooled the funds to construct a single complex rather than two separate buildings or renovation projects for photonics and geology. Corkum and Clark’s two CFI grants alone pay for 40 per cent of the construction costs of ARC. The Ontario government, recognizing the opportunity to have a world-class research facility in the province, agreed to match the CFI moneys, bringing the total to $25 million. Boyd contributed a further $1.5 million, and the university administration is covering the remainder of the construction costs (although according to the administration it has currently requested a further $2–3 million from CFI). A host of private partners have contributed to the scientific equipment that will populate the research centre. Because of the sensitive nature of the optical and electron microscopy experiments to be performed in ARC, significant care was taken to design a building that would be stabilized against even the smallest vibrations from the outside world. In standard structures, wind, passing trucks, or even students running to class can cause tiny vibrations to reverberate through the building and misalign laser experiments. Corkum’s laser system will be attempting to image flash frozen cells 50 nanometers (nm) at a time using highly focused laser beams to desorb molecules and reveal what each 50-nm area is composed of, which is the primary reason why ARC is located on the east side of King Edward Avenue. One thing the U of O cannot afford to do is waste space; however, the core researchers need only two floors. Photonics researchers will be on the third floor and the fourth floor will be space for geoscientists. The three lowest floors of the complex will be completed by 2014, but the top two floors will be “shelved,” left empty as an investment in space for the university in the future. The microscopic world of E. coli and other bacteria is a mixed-up place. Some bacteria can swim from location to location—but a storm of random collisions with thermally raging fluid particles knocks the microscopic microbes for a loop. This diffusive mixing makes it next to impossible to keep bacteria with different mutations separate from each other. Yuguo Tao is a post-doctoral researcher in the department of physics at the University of Ottawa. Tao is a computational biophysicist who builds computer models to simulate the life of a cell. By letting many of these virtual cells move around, compete for food, divide, and eventually die, Tao has studied the behaviour of assemblies of many cells, such as the colonies of cells that form the living films on your bathtub or behind the tap of your kitchen sink. Tao is interested in building geometries that can trap cells of one type but not of another. With future devices of this kind, cells could be sorted, and diffusive mixing could be overcome. One existing system that is able to do this is a wall with funnel-shaped openings. Previous experiments on E. coli using this setup have shown a difference in cell concentration between the two sides of the wall. Tao’s simulations show cells that don’t swim and only diffuse randomly will be found in equal concentrations on both sides of the wall, but cells whose motion is made up of random swimming (like E. coli) become concentrated toward the right-hand side of the funnels. The better they swim, the more concentrated the cells become. Cells that swim are organized by the funnels: the number on the right and left sides of the wall is determined by cell size, rigidity and ability to swim. So by arranging many of these walls in a row, Tao can sort cells by their physical properties and keep different populations separate from each other. YOUR BODY IS made of trillions and trillions of cells of different types. Each cell knows its type, but what determines the type of cell that each becomes? How did your liver cells know to specialize into a liver or your brain cells to become neurons? Andrew Pelling, the Canada research chair in experimental cell mechanics at the University of Ottawa, does research on the interface between molecular biology, physics, and engineering. He’s interested in the dynamic mechanical properties of cells and how they control cell differentiation and tissue formation. On top of running a multidisciplinary laboratory in the physics and biology departments, Pelling partakes in bioart and engages in social media. One of his ongoing projects is an artificial tissue sample that automatically tweets its growth to the twitterverse. Pelling wants to know how a cell’s fate is set. In particular, he is interested in how external geometry and forces can signal strong cues that determine how a stem cell differentiates or that encourage a specialized cell to change its behaviour. Pelling pulls, stretches, and pokes individual living cells. One way he manages this mechanical manipulation on such tiny life forms is by retrofitting an atomic force microscope into a tiny prong for poking and pulling. This way, he can apply very controlled forces onto specific spots on cells, such as their nuclei. Pelling poked the nucleus of various cells and watched the response. He observed that immediately after the poke, the long filaments that run from the nucleus to all corners of the cell (forming the cytoskeleton and giving shape and rigidity to the cell) would quickly deform in response to the force on the nucleus, rather than reacting directly to the force of the tiny prong pushing down on the cell. Much more slowly, the entire cytoskeleton would reorganize itself by retracting the filaments from the edges of the cell and then relaxing into a new structure. Instead of occurring equally throughout the cell, however, restructuring occurred in only one or two locations. Restructuring its cytoskeleton is just one way that a cell can respond to stress. In fact, Pelling has been looking at many other environmental cues, like stretching the surface that a cell is living on or placing cells in confining geometries. Cells dynamically respond to a complicated set of environmental signals that ultimately determine their fate. 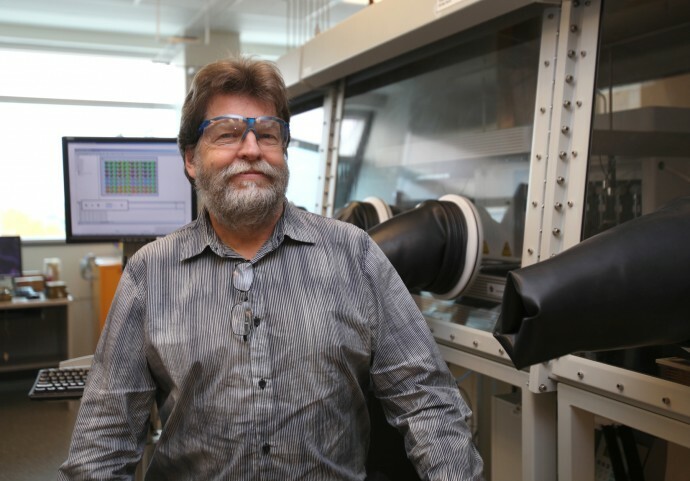 The CCRI’s robotic catalyst synthesis tools (pictured behind Professor Baker) allow the researcher to run a large number of reactions at once on a very small scale in a fully-automated fashion, minimizing cost, time, waste generation and experimental error. Tom Baker has done a lot of chemistry. In fact, he was recently awarded the Canadian Green Chemistry and Engineering Award from the Chemical Institute of Canada for his contributions to catalysis science geared towards energy applications for sustainable and green chemistry. Before arriving at uOttawa, Tom spent fifteen years at DuPont CR&D developing applications for homogeneous catalysis involving fluorochemicals, titanium dioxide, and nylon intermediates. In 1996 he joined the Chemistry division at Los Alamos National Laboratory where he led projects in bi-functional and multiphasic catalysis approaches for alkane functionalization and chemical hydrogen storage. In 2008 Baker joined the Chemistry Department at uOttawa as Tier 1 Canada Research Chair in Catalysis Science for Energy Applications and became the Director of the Centre for Catalysis Research and Innovation. The Centre for Catalysis Research and Innovation (CCRI) is a huge (18,000 sq. ft.) state-of-the art facility housed in the Biosciences Complex, andfeatures robotic chemistry tools for rapid discovery as well as microscopes that can ‘see’ the elements in very small catalyst particles. The CCRI comprises thirty university researchers who each study catalytic chemistry but come from all across campus, making the centre both multidisciplinary and yet highly focused. Baker sees the CCRI as an ideal hub for collaboration: through the centre the University of Ottawa can offer its catalysis research scientists equipment that would otherwise be unaffordable. One of the Baker’s projects is to use the CCRI to study is how certain metal catalysts (catalysts are guest chemicals that speed up the rate of a chemical reaction) could be used to selectively break carbon-carbon bonds in wood-derived lignin and so convert biomass into usable energy. Not only does the centre attract world-class researchers (six are Canada Research Chairs) and outstanding students, but it also partners the University of Ottawa with industry. In many ways, these partnerships lie at the heart of how Baker runs the CCRI. He pushes researchers to move beyond the one-researcher-with-one-company-for-one-project-type of collaboration into collaborations between two or three companies and a half dozen university researchers at one time. Baker and the CCRI are building bridges to help move scientific discoveries from the ivory tower into the Canadian economy with greater fluency.